[Stride]-Stride Step-[Choose one or more cards with the sum of their grades being 3 or greater from your hand, and discard them] Stride this card on your (VC) from face down. 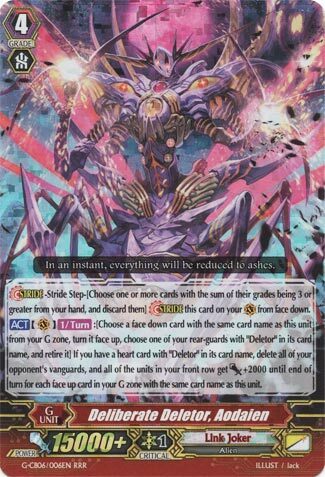 [ACT](VC)[1/Turn]:[Choose a face down card from your G zone with the same card name as this unit, and turn it face up & Choose one of your rear-guards with “Deletor” in its card name, and retire it] If you have a heart card with “Deletor” in its card name, delete all of your opponent’s vanguards, and all of the units in your front row get [Power]+2000 until end of turn for each face up card in your G zone with the same card name as this unit. Well, it’s not as though Deletors ought to be expected to rely on Eigorg for everything, right? So Deletors get this as a first Stride instead. You’re mostly looking for the Delete, combining it with the new starter of the new Stand Trigger along the way to +0 wash. Powering up, unless it’s second Stride, generally won’t matter assuming fairly normal columns of 16k, but there are stronger attackers in Deletors who can use this to reach 20k and kiss magic numbers on a deleted Vanguard. Reasonably strong, general in use and timing…ticks the right boxes for what it is. WHAT’S UP, ROGUE SQUAD?! So, after a long hiatus from the internet in general, I’ve decided to make a return that’ll hopefully stick around a little longer than a cameo here and there, and with all of the new Link Joker stuff that just came out, I saw a lot of people lean towards Chaos and Messiahs, but little to no people touched the third archetype in the set, so I took it upon myself to decide what this week’s cards will be, and what better way to make a comeback than to…DELETE the meta, so let’s have a lok at the new G Unit, Deliberate Deletor, Aodaion. Aside from another card that we will be reviewing later on this week, Aodaien is one of the few G Units that Deletors have, and it’s a damn good one for its deck. At a cost of a G Persona Flip and retiring one of your Deletors, your opponent’s Vanguard is Deleted, and your front row gets +2000 for each Aodaien you have face-up in your G Zone, so if it’s your first Stride with him, then that’s 2k right there, and if it’s the second go-around with him, then it’ll be +6k to your front row. The only real drawback for it is that you have to kill a Deletor, but considering that new Deletors get to essentially replace themselves with other units from the top of the deck when they get killed off, so that -1 ends up becoming even in the end while you get to pummel on a 0 power vanguard with potential 20k columns and a 30k+ vanguard. This is an excellent card for an underestimated deck, and I, personally, can’t wait to complete this deck, so I can go around DELETING everything around me. Next Time: Is it pronounced Grei or Grey?